MUSCLE RECOVERY SUPPLEMENTS: L-arginine is known to effectively support blood flow, which means it helps bring nutrients and oxygen to muscle and joint tissues. This means with L-arginine's help, you can enjoy more of the many benefits of exercise but with less pain. BRAIN BOOSTER: One of the most common uses for this amino acid (L-Theanine) is to decrease stress and anxiety. Most research assessing the effects of theanine on brain function. These studies have found that this compound can affect the serotonin and dopamine levels in the brain, creating an anxiolytic effect. AMINO ACIDS PILL: Tyrosine is one of the most important amino acids, which is used in the synthesis of structural proteins. Although proteins are made up of different other amino acids but tyrosine is considered to be the most important one, because it is used in the production of neurotransmitters. Some researchers say that tyrosine directly affects the brain. GYM PILLS: L-alanine is a popular supplement for bodybuilders and other athletes who train for strength increases. L-alanine is important in the process that uses glucose to fuel energy production. Alanine may help to protect muscle cells from damage caused by intense aerobic exercise. By improving glucose utilization, L-alanine may help to prevent muscular catabolism for energy production. It also may support liver functions. 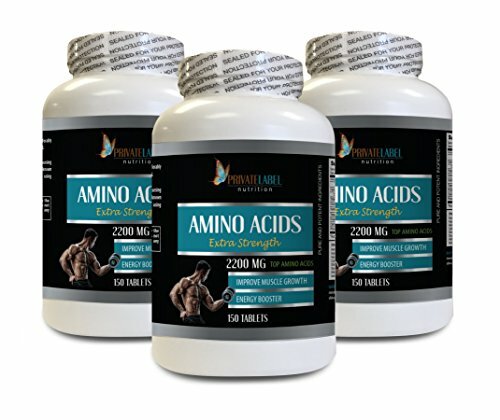 AMINO ACIDS 2200 EXTRA STRENGTH: This powerful formula can be beneficial for boosting athletick performance, muscle mass, muscle recovery, burn exess fat and increase energy level. Also may support brain functions, healthy mood and immune system functions This complex contains: Alanine, Arginine, Aspartic Acid, Cystine, Glutamin Acid, Glycine, Histidine, Isoleucine, Lysine, Methionine, Phenylalanine, Proline, Serine, Threanine, Tryptophine and Tyrosine. MUSCLE ENLARGEMENT: Increasing your intake of lysine may help enhance your athletic performance. Amino acids such as lysine are the building blocks of proteins. In conjunction with other amino acids in your body, lysine may help maintain lean body mass and healthy growth and development. MUSCLE MASS BUILDER: Whether your goal is to increase athletic performance, boost metabolism, improve recovery or even build muscle, research shows that L-glutamine can significantly aid your efforts. During an intense workout, your body becomes stressed and your muscles and tendons require more glutamine than the amount supplied by a normal diet. Supplementing with L-glutamine allows your muscles to fight and push a bit further, which boosts your strength and helps repair your skeletal muscles. IMMUNE SUPPLEMENTS: A number of studies have researched this, finding that Tyrosine supplementation may be useful under conditions of not only stress but also cold, fatigue, prolonged work, and even bad sleep. There is also some evidence suggesting that cognitive function may improve under these conditions. In many online Tyrosine reviews, users have said that they find this supplement enhances mental performance and intellectual capacity.